Residual magnetic intensity values are given in gammas. The original total field data were corrected for diurnal variation as observed at the Tucson Magnetic Observatory during the flight period. Ref: Sauck, W.A. 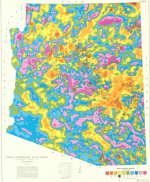 and Sumner, J.S., 1970, Residual Aeromagnetic Map of Arizona. University of Arizona Geophysical Society, 1 map sheet, map scale 1:1,000,000. Gravity data were obtained from surveys by the Laboratory of Geophysics of the University of Arizona, U.S. Defense Mapping Agency, U.S. Geological Survey, Exxon Corporation, and mining companies and contractors. 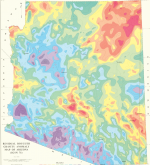 Ref: Lysonski, J.C., Sumner, J.S., Aiken, C. and Schmidt, J.S., 1980, Residual Bouguer Gravity Anomaly Map of Arizona (IGSN 71). University of Arizona Geophysical Society, 1 map sheet, map scale 1:1,000,000. We greatly appreciate the permission from University of Arizona Geoscience Dept. Chair Pete Reiners and the UA Geophysical Club to make these available.